Britain is one of the premier destinations in the world for long-distance hiking. Surprisingly, very few North Americans know about this. 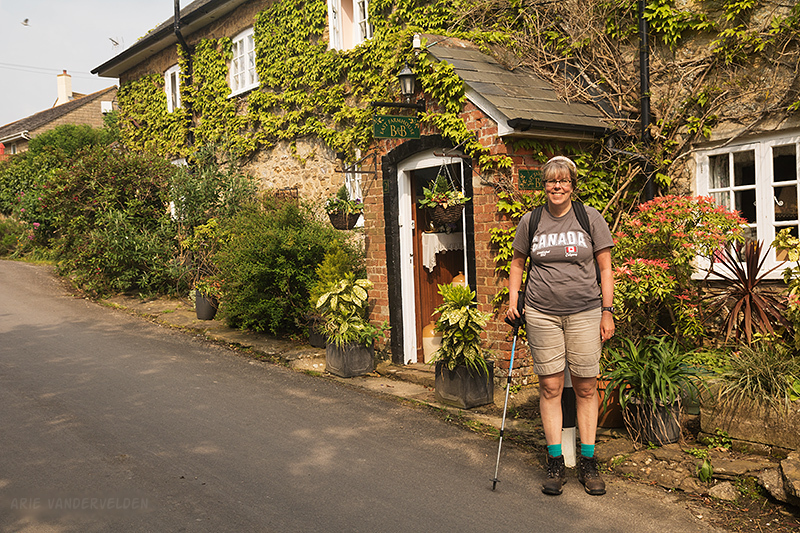 Many people are aware of the Appalachian trail in the eastern U.S. and the Camino de Santiago in northern Spain, but ask someone about Offa’s Dyke or the Pennine Way and you’re bound to get puzzled looks. In short, these trails are a well-kept secret. The British trail system is simply outstanding. The trails are well maintained and often so well signed that it is near impossible to get lost. Other long-distance trails like the Trans-Canada trail or the Camino de Santiago follow highways for substantial parts of their length. Hiking between a guardrail and traffic zipping by at 100 km/h is not much fun in my books. The British long-distance trails are not like this at all. Most of the trails are actual single-track hiking trails, jeep trails, quiet country roads, and sidewalks through towns. These trails are the result of historical right-of-ways that were used before cars were invented, and also through the cooperation of thousands of private landowners who have allowed trail construction on their land. This access to private land is unique. 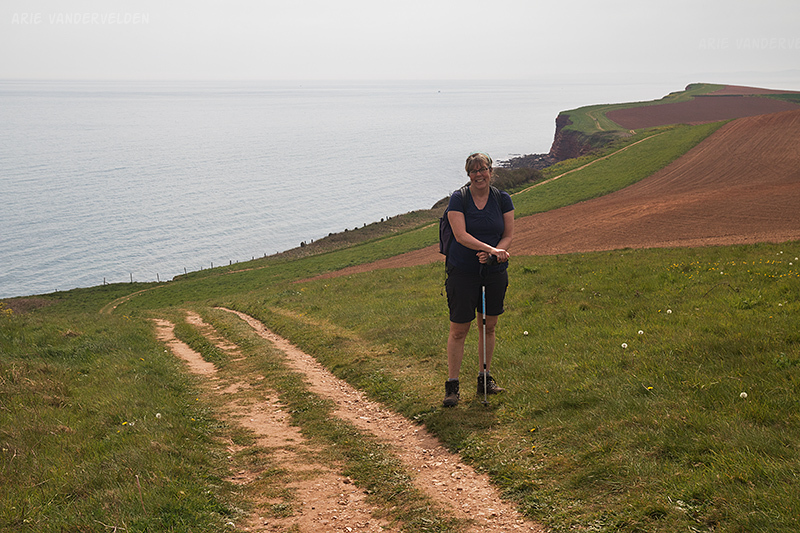 Southwest coast path, near the Somerset-Devon border. The trail is also visible on the hillside in the distance. The Southwest Coast Path. This 630 mile (1000 km) trail starts in Minehead, Somerset, and winds all the way around Devon and Cornwall, ending up in Poole, Dorset. Official website. Day-by-day guide. Four guidebooks cover different sections of the trail. The Jurassic Coast is a subsection of this trail. Pembrokeshire Coast Path. This 186-mile (300 km) path in the Welsh county of Pembrokeshire is regularly voted as one of the most scenic hikes in the world. The county’s shoreline is protected by the Pembrokeshire Coast National Park. Website. Website. Guidebook. Wales Coast Path. 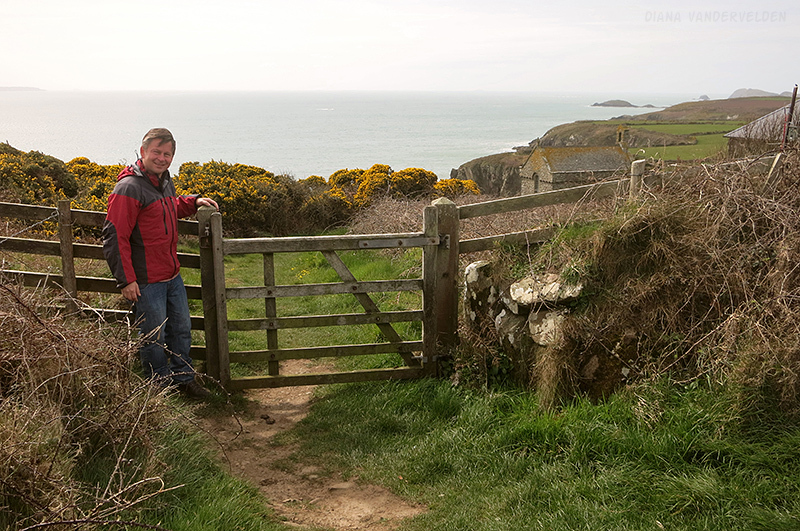 The Pembrokeshire Coast Path is part of a larger trail system that goes around the entire coastline of Wales. The whole thing is 870 miles long, or 1400 km. Website. Coast-to-Coast. This trail starts at the Irish Sea and crosses the Lakes District National Park, the Yorkshire Dales National Park, and the North York Moors National Park before arriving at the North Sea. 192 miles, or 310 km. Wikipedia. Guidebook. Hadrian’s Wall. This trail also goes from the North Sea to the Irish Sea. It’s shorter, easier, and at lower elevation than the coast-to-coast walk. There are lots of Roman ruins along the way. 84 miles, or 135 km. Website. Cotswold Way. This 102-mile (165 km) trail through the Cotswold Hills starts in Bath and ends in Chipping Camden, taking in some classic English countryside. Website. Guidebook. Pennine Way. One of Britain’s oldest long-distance paths, this 268 mile (430 km) trail traverses the spine of northern England. Website. Guidebook. Offa’s Dyke. This 177 mile (285 km) trail follows the early medieval earthworks that mark the border between England and Wales. Website. Website. Guidebook. This is not an exhaustive list. 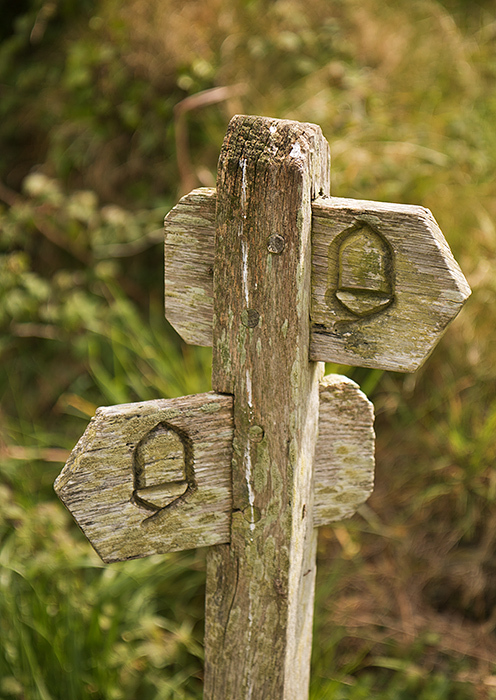 There is the South Downs Way, North Downs Way, Norfolk Coast path, the Ridgeway, Thames Path, London Loop, and more. Currently there is a project underway to have a continuous walking trail around the entire perimeter of England. This 2800 mile (4500 km) trail should be complete by the year 2020. Amazing! Trail marker. National trails are marked with the acorn. We get up at around eight or so and go downstairs to have breakfast. 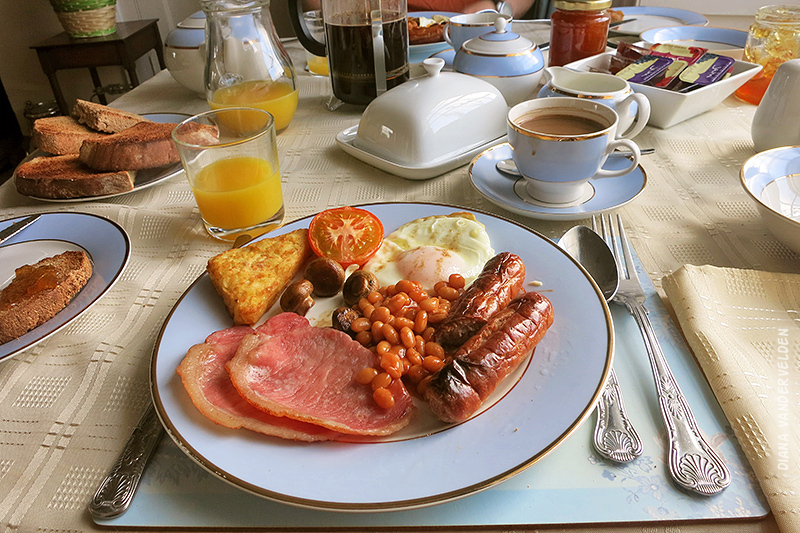 Most B&Bs serve a full English breakfast: eggs, sausages, bacon, baked beans, fried tomatoes, fried mushrooms, toast, and jam. Sometimes there’s black pudding (blood sausage) as well. It sticks to the ribs and will keep you going for most of the day. After breakfast we go back to our room to get ready to the day. All rooms in the UK have tea-making facilities, and we make a pot of tea in a thermos flask. We prepare daypacks with snacks, cameras, and clothing for the day. In most instances that means bringing rain gear, just in case. We put on the hiking clothing, hiking boots, and get the hiking poles ready. The remaining gear goes in our big packs for which we arrange a luggage transfer. The big bags have to be ready before nine, in case the driver comes early. A full English (or Welsh) breakfast. We settle the bill with the B&B owner, and often end up chatting for a while. We then set off down the trail. On most days there will be a variety of hiking: single-track hiking trails, double-track dirt roads, quiet little country lanes, esplanades (waterfront walkways), and sidewalks through villages and towns. Often there will be a variety in weather as well. So far we have hiked these trails only in spring (March-May) and the trails have never been busy, even on bank holidays. Many trails have frequent access points, and on weekdays we’ll meet some dog-walkers. On weekends there will be dayhikers out on the more popular and scenic stretches. Occasionally we’ll meet another through-hiker. The locals are friendly, and when we tell them we’re from Canada they’ll often pause to chat. Big fry-up breakfasts and pub- or restaurant dinners means that we typically eat only snacks for lunch. Fruit, scones, or Welsh cakes do the trick. On an easy day we’ll reach our destination in the early afternoon, and on longer days it’ll be late afternoon. We find our B&B and check in. Our overnight bags will have been delivered to the B&B, and often they’ll be already in the room. We peel off soggy clothing, boots, have a refreshing shower, and change into dry “street” clothes. We dig into our overnight pack and find supplies for happy hour. We’ll relax and check email, and I’ll write an email about our day. It’s my way of keeping a diary. Depending on energy levels and weather we’ll go out and have a look around town. We’ll stop by a grocery store to pick up snacks for the days ahead. We ask the B&B owner for dinner recommendations. In small towns this means the local pub. Rural pubs in England are a lot of fun. They are the center of the community, and often have been so for centuries. People young and old will gather at the pub. They’re a great place to people-watch and to talk to the locals, when nursing a second pint after dinner. We go to bed, sleep, and do the whole thing again the next day. It takes a few days to get into the rhythm of things. It is liberating to go day after day without motorized transport, seeing the landscape change as you go, and seeing your progress on the map. There are companies who will organize everything for you. You pick an itinerary and they’ll book your accommodations, organize the luggage transport, and they’ll send you a package with maps and information that tells you where to go. Prices are around 100 GBP per person per day. See for example Contours Walking Holidays. 1) Get some information about the route. Get a guidebook, or else some trails have great websites. 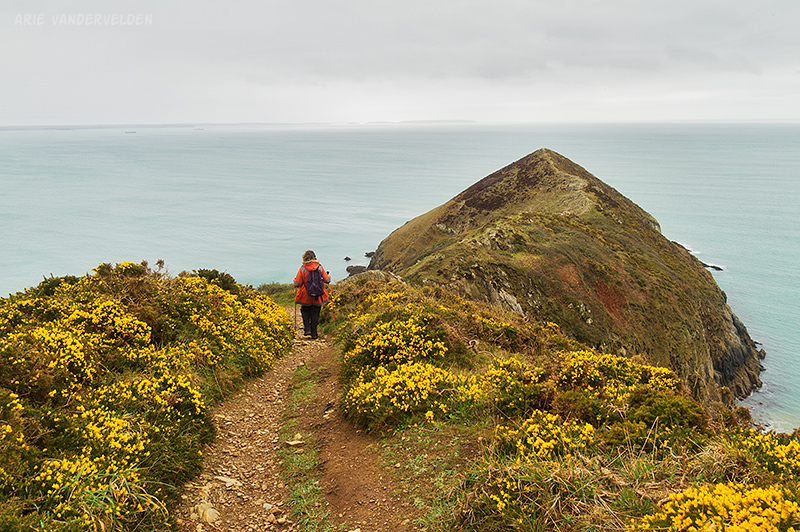 For example, the Southwest Coast Path day-by-day guide is an invaluable resource. 2) Divide up the trail into day-sized chunks. We like to alternate longer days (12-14 miles) with easier days (7-10 miles). Some people with lots of energy will want to do longer days. We like to have a bit of extra time to be able to see things along the way and to explore detours. Start a spreadsheet (or use a piece of paper) and write down the dates and places to stay for the night. Make note of military areas, if any (which typically can only be hiked on weekends, see guidebooks) and estuaries that need to be crossed by ferry (check out ferry schedules). 3) Study the route on Google Maps. Note that day-by-day guides on websites and in guidebooks have already pre-divided the itinerary into day-sized chunks. This doesn’t mean that you must stick to this itinerary. If you see a town along the way you’d rather stay at, then go back to step 2 and refine your itinerary. 4) Look at accommodation options on major booking sites such as booking.com, expedia, and trivago. Be sure to look in map view. Take note of availability, rating, prices, and cancellation policy. Start penciling things into your spreadsheet without making the actual bookings. Note that this is the time-consuming part of the job. You should also have a look at airbnb. Airbnb sometimes has options available in places where there are no hotels on the major booking sites. Also have a look at google maps; there may be placemarkers for accommodations that book on their own websites. Note that these often turn out to be cottages that rent by the week. East Farmhouse B&B, Abbotsbury, Dorset. Stay elsewhere by making a longer or shorter day out of it. Go back to step 2 to reconfigure your itinerary down the line. Decide to skip a step or go somewhere else with public transport. Go back to step 2. Build in a rest day somewhere, so that accommodation is available further down the line. Accommodations often book up over the weekends in smaller places. Quaint towns near sandy beaches are the most popular. You may end up staying in larger towns over the weekends. It’s a good opportunity to do some laundry and to see local sights. Decide to take public transportation or a taxi to or from the trailhead or the trail’s end. For example, in Pembrokeshire, we stayed in St. Davids, a central location on the peninsula. From here we were able to do three days walking around the peninsula using a bit of public transportation. Or, for example, take North Devon. We wanted to hike from Ilfracombe to Woolacombe and then from Woolacombe to Croyde. Ifracombe and Croyde had good accommodation options but Woolacombe did not. We hiked from Ilfracombe to Woolacombe and took the bus back to Ilfracombe, stayed the night, and then the next day we took the bus from Ilfracombe to Croyde, and then hiked Croyde to Woolacombe. Note that some rural areas (e.g. Wales) have no bus service on Sundays. 6) Go back to step 4 for the next day’s accommodation. 7) Once you are happy with your itinerary and you’ve checked it twice, then go ahead and commit. Pull out the credit card and make the actual bookings. Don’t leave it too long because availability may change, and then you’ll have to start again. 8) At this point, we forward our itinerary to our luggage-transfer company www.luggagetransfers.co.uk. Be sure to indicate which are airbnbs. Airbnb often doesn’t provide the exact address of the accommodation until a few days before the stay. We have been quite satisfied with the luggage transfer service. It’s probably possible to do this on-the-fly by talking to B&B owners and asking for phone numbers of the local taxi guy. But it’s nice to have the luggage transfer pre-arranged. 9) Start booking your public transportation to the trailhead, and back again at the end of the trip. Start google maps, click on Directions, put in your starting point (e.g. London Victoria) and your ending point (e.g. Exmouth), put in the exact dates. Then click on the train or bus icon to see your options. Note that Britain does not have a nationalized rail system; rather, individual companies run certain lines. When you buy rail tickets online, you can choose salutations other than Mr or Mrs. Lord and Lady are also available. How British! There are savings to be had purchasing your train tickets in advance. In certain instances, coaches run by National Express can also work out to be efficient modes of transportation. They are particularly handy going to and from airports. For local buses, just show up at the bus stop and pay the driver. I have brought Goretex jackets and thinner rain jackets, and either will work fine. Goretex is warmer and is preferable for hiking earlier or later in the season. 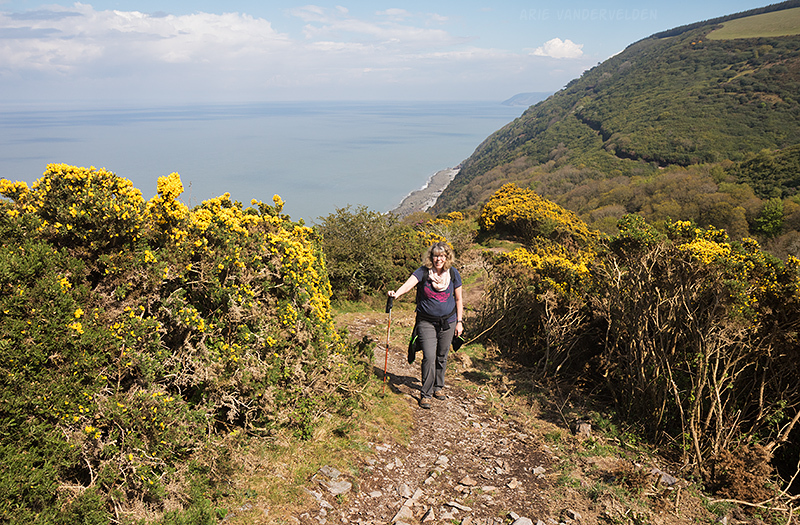 I used Goretex in Wales in Late March / Early April, and a thin rainjacket on the southwest coast path (April and May). I have worn both waterproof backpacking boots and light hikers while hiking in the UK. Waterproof boots will keep your feet dry and you’ll be warmer. They also have more ankle support, and you’ll feel less of the rocks underfoot. But they are heavy and awkward for non-hiking use (on the plane, in the train, going for dinner, sight-seeing about town). Light hikers work well in better weather. I have not yet had to use tidal charts to make decisions, but it’s fun to print them out anyways. Find them here. We usually bring one set of hiking poles to share between the two of us. I suggest bringing a thermos flask for tea. Bring a Swiss army knife for opening cans, bottles, and slicing scones and bread. A headlamp can come in handy at times. I always bring a toque (wool hat). Bring a mobile phone. Bring a guidebook and/or maps. Bring a little tube of sunscreen for those rare sunny days. We bring umbrellas; most days we’ll have them in the luggage transfer bags, but some days we use them on the trail. They are useful when it’s not windy or in sheltered areas. You’ll need a set of rain pants. Be sure to dress in layers. One warm day I wore shorts and didn’t bring rain pants. The trail ended up being overgrown with stinging nettle in places. The lesson learned? Always bring rain pants. The coastal trails often skirt around the edges of farmland. Jurassic Coast. Costs of a UK walking holiday. Total: 130 GBP per day for two people, or 65 GBP per person per day, or 110 CAD per person per day. British pounds are expensive. The British pound is currently trading at about 1.7 CAD to a pound, thanks to Brexit uncertainty. A few years ago a pound cost 2 CAD. Accommodation prices are for the shoulder season. If you go in high season you’ll pay more. Certain popular destinations such as Cornwall cost a bit more. A luxury boutique hotel will cost more. A room in an airbnb will typically cost less. There are some hostels along the coast (YHA) which will cost substantially less. Dinner is for a meal in a pub or restaurant. This could be a better-quality fish-and-chips (cod or haddock, freshly battered), a meat pie, a meat-veg-and-potatoes kind of dish, or similar. Or it could be a curry in an Indian restaurant. Fast food will cost less, and fine dining will cost more. We like having our luggage transfer, and think it’s well worth the money. Some days we end up taking a rest day or taking the bus, saving the luggage transfer cost. But I haven’t included public transportation costs, so on the whole the daily budget should work out. It’s possible to go Camino-style, with a 40L backpack containing nothing but the bare essentials, thus saving the luggage transfer fee. I have also seen along the trail (and read blog posts by) people with full overnight backpacks containing camping gear. The choice is yours.